One of the biggest investments that go into opening a new restaurant is in the kitchen. A commercial kitchen needs industrial-grade equipment that can withstand busy restaurant use. The layout of a commercial restaurant kitchen should allow food to flow seamlessly from the prep area to the line. Sometimes a new restaurant has a fabulous location, but a small kitchen space, which dictates the kind of kitchen equipment needed. You may really want the six-burner gas range with a convection oven, but in reality, your kitchen will only fit a four-burner range. The kitchen is the heart of your restaurant, where your menu comes to life. It’s where food is prepared, cooked and plated. Typically it is where the dishwasher is located, the food is stored, and is home to all the various utensils, dishes, and cooking equipment. Unlike in a home kitchen, where it’s just you and your family, a restaurant kitchen can have dozens of people in and out of it on any given shift, so it’s important that it's organized well. This not only saves time during the busy rushes, but it also helps the staff avoid accidents and reduces excess waste. One of the biggest expenses for most new restaurants is the kitchen. A $250,000 loan might seem like a lot of money when you are first getting ready to open, but it can run out quickly after you've invested in new, or even used, ranges, grills, ovens, and coolers. If you purchase new kitchen equipment, remember that, just as with a new car, these items depreciate the moment they leave the showroom. One way to save money during the start-up process is to purchase used kitchen equipment. You take the risk of carrying no warranty with used equipment, but certain pieces, like gas ranges, rarely break during the warranty period anyway. When shopping for kitchen equipment, remember that salespeople will try to sell you more than you need. While it is tempting to want to buy every shiny, popular item, you only need a few basics to get you started. You can always add things later on. So, just walk away from the commercial smoker or the industrial grade ice cream maker until you are sure smoked ribs and soft serve are integral to your restaurant menu and concept. You can also find good deals on gently used kitchen equipment, like oven ranges and refrigerator units. Be mindful that buying used restaurant equipment is not always your best option since it does not usually come with a warranty. 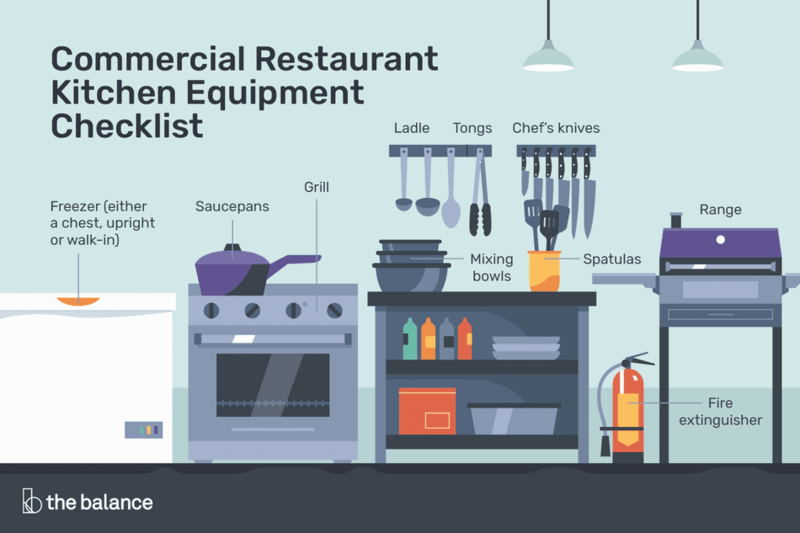 Depending on the size of your restaurant kitchen and the restaurant concept, you may not need every item. Or you may need other types of equipment more specific to your restaurant concept, such as an ice cream maker if your restaurant will make artisan ice cream, or bread pans if you plan to make your bread in-house.